I have been a fan of anything UFO related since my father first introduced me to flying saucer films from the 1950s. I have such fond memories of watching Creature Feature with him on Saturday afternoons as a kid. I loved the corny B-films as much as the classics. As an adult that fascination continued with The X-Files, Ancient Aliens, Coast to Coast Radio and the Lore podcast which dips into aliens from time to time. 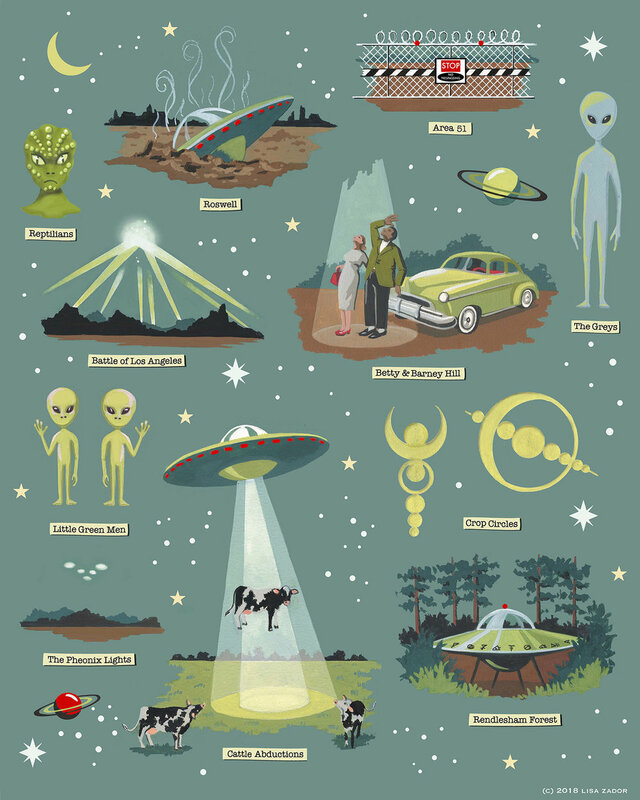 I thought it was time to pay homage to this genre which has brought me so much pleasure over the years with this print highlighting some of the important events in UFO history including the Roswell crash, the Area 51 incident and the Betty and Barney Hill abduction, to name a few. I really wanted it to have a retro feel and touch of humor that would harken back to those 1950’s films. It is the first in a new line of prints, note cards and kitchen towels that I am adding to my sister shop on Etsy: Curious Print and Pattern. I encourage anyone with a mild interest to look into these events further, it is chilling stuff and will totally draw you in! 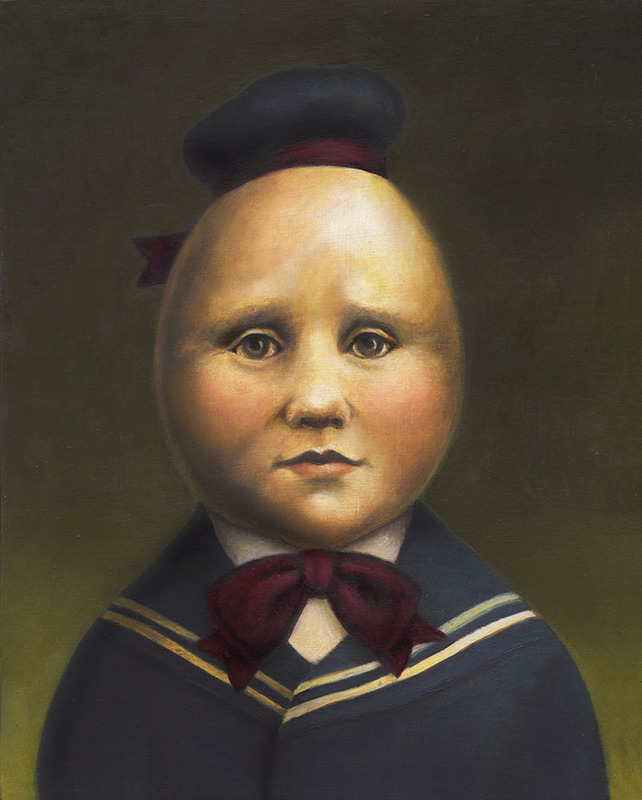 This portrait, painted about 15 years ago holds a very special place in my heart because it is of my dearest, most treasured childhood toy, Green Bunny. He was passed on from my brother to my sister and by the time I had him he had faded to pale yellow. He had been so loved that he was missing his eyes and mouth. I sewed jingle bells on for eyes and that is how he remains today. When I was 5 years old my family moved from Philadelphia to New Jersey and somehow during that move my beloved bunny was lost. It was such a deep loss for me at that age and I truly mourned him. I never stopped thinking about him and launched many searches throughout the house to no avail. Then one day, years later, my cousin Cindy and I decided to explore some forbidden boxes way back in a closet that were at the bottom of a tall pile. I clearly remember trying to pry open the flaps and peek inside without toppling over the stack. I found curtains folded on top, one of the least interesting finds to a child, but kept digging deeper until my hand touched something soft and fuzzy which I slowly pulled out. To my astonishment it was Green Bunny. I honestly don't think I have ever been happier than when I saw that faded little face. I think I was actually speechless with shock but then burst into tears of absolute joy. Over the years since then I have suffered deep, personal losses in my family and I believe that somehow, this painting became a representation of them all. It wasn't intentional: it started out as a simple study but it has remained hanging on my wall and has the ability to bring to me to tears but also to give me a great sense of comfort. It is a thread that connects me to my past: to a childhood spent surrounded by a close and loving family. Today is the anniversary of my mother's death and when I was feeling her loss this afternoon I looked up and this portrait reminded me that her spirit is around me every single day. This pink elephant was originally begun as an homage to one of my favorite elephants of all time: the polka dot elephant from Rudolph the Red Nosed Reindeer animated movie. Since I was a child that sad little elephant has haunted me. My childish mind couldn’t comprehend why he had been banished to the Land of Misfit Toys, I would cry to my Mother that I wanted him even if no one else did. When I was putting away my Christmas ornaments this January, including my polka dot elephant ornament and stuffed toy the idea for this portrait was born. Of course few paintings progress as planned and I soon realized as I painted that the polka dots were not going to work: they made him look as if he had measles which, of course, was not my intent. The half finished painting sat there for weeks in my studio staring out at me. At some point I realized that every time I passed by, the jingle from Crispy Critters would run through my mind. For those of you that do not remember Crispy Critters, it was a popular cereal in the 1960s that was 90% sugar and that came in the shape of animals: monkeys,Tigers, lions etc. At one point pink marshmallow elephants were added and I was beside myself. According to my sister, I was already inexplicably obsessed with elephants and every time the commercial came on TV with the special Pink Elephant jingle, I went nuts. (Unfortunately I cannot find that particular jingle on YouTube so you'll have to take my word for it). All these years later that annoying jingle became the key to solving the problem of this painting and I went forward making the elephant a nice shade of salmon pink which, it turns out, worked perfectly with the deep olive green ground I had already painted. The portrait pretty much finished itself from there. So even though in color, he resembles the pink elephants of Crispy Critters, to me he remains a poignant reminder of that neglected polka dot elephant on the Island of Misfit Toys that no one wanted. Pink Elephant Brooch and Ornament from Curious Portraits. Prints, notecards, brooches and ornaments featuring the Pink Elephant are available in my shop Curious Portraits. 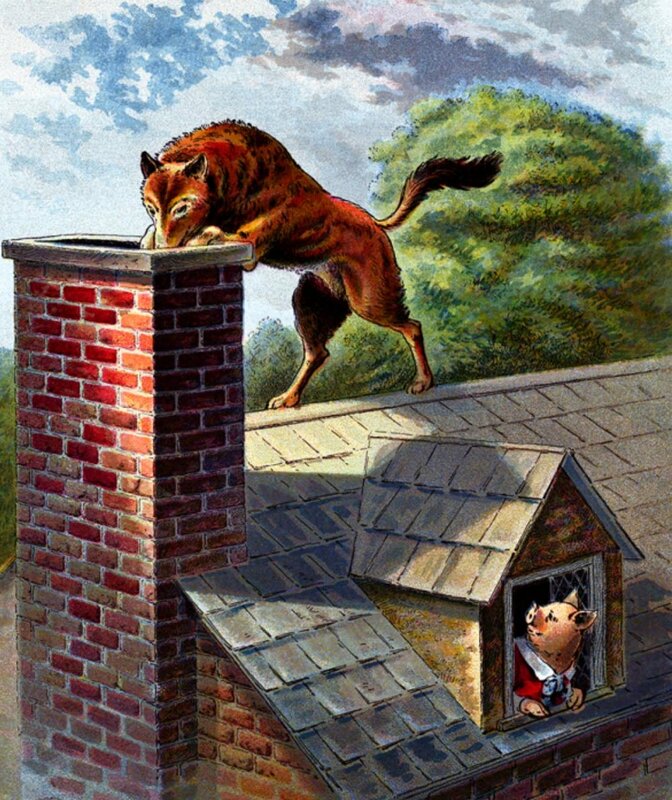 Wolves have gotten a bad rap over the years, especially in children’ literature. When I first thought of doing a wolf portrait, the first wolves that came to mind were from The Three Little Pigs and Little Red Riding Hood, both of which were rather mean and intimidating. It got me thinking of how some people who are gruff on the outside are often actually masking their own vulnerability and insecurity with their behavior. They just need someone to listen to them and offer some understanding and friendship. So I reasoned that if people could be that complex, wouldn’t it be possible that wolves could also have a softer side? 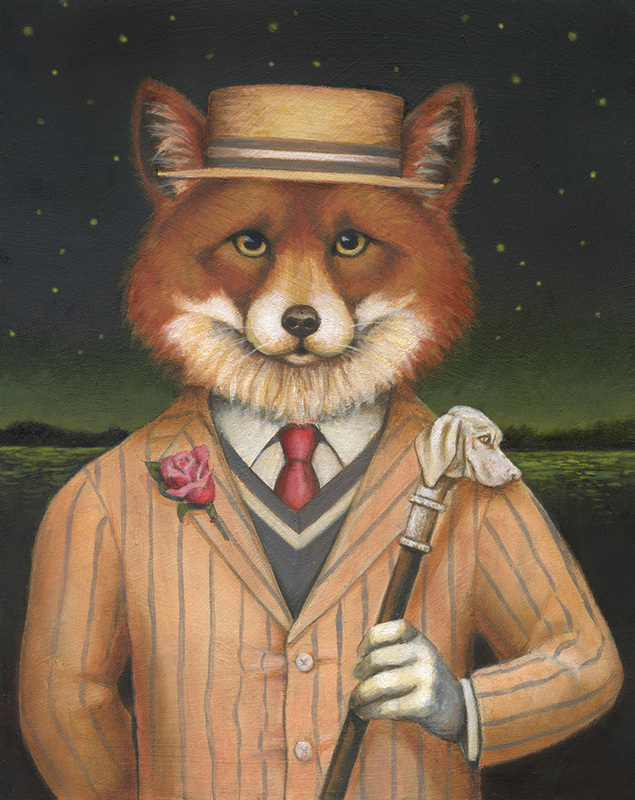 Now I know that in reality wolves are nothing to take lightly but since the animals in my portraits are usually wearing clothing, I thought I could stretch that a bit with artistic license. So here is my portrait of a woodland wolf, gathering red berry branches to liven up his little den: wise and perhaps a little stern but also kind-hearted with a gentle, sensitive side. The Three Little Pigs - illustrator unknown. McLoughlin Bro’s: New York. Ca 1900. 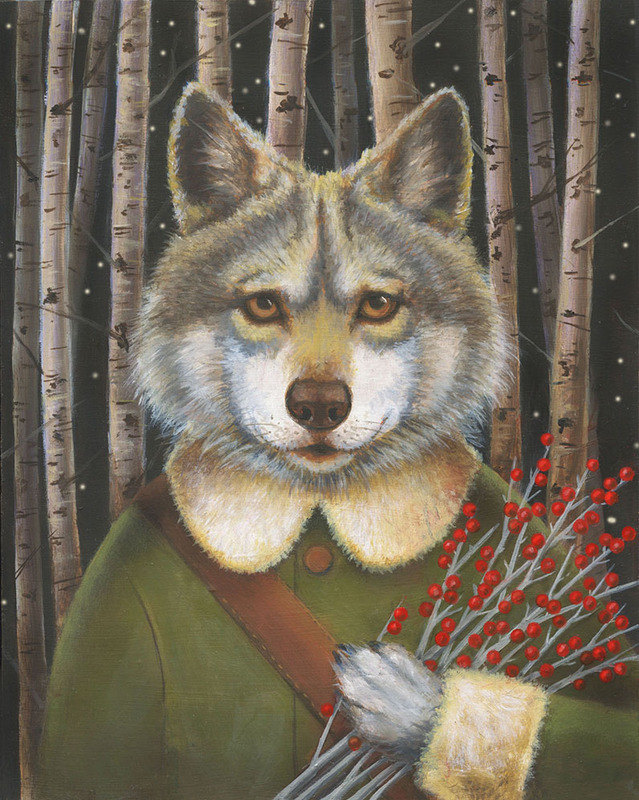 Prints of the Woodland Wolf are available at my shop Curious Portraits. I just finished one of the most enjoyable and unusual projects: designing and painting the images for a retro puppet theater. When Brian and Hanson of Puppet in the Pantry first contacted me and told me about their vision of a puppet theater with a vintage, sideshow feel I was very excited. We bonded immediately on our love of vintage carnival, circus and boardwalk ephemera and also our shared dog lover-mania. The first thing we did was decide to put their dog Daisy and my dog Bingo's portraits dressed as clowns on the antique doors for the front. The space was tall and narrow so I designed a scroll pattern to frame the portraits and painted it in gold metallic. We used this gold ornamentation on the other pieces to tie it all together. They have a carpenter working with them who created a wooden die cut for the front of the theater. Brian and Hanson sell vintage toys and wanted me to add some toy soldiers and since Brian used to be a Broadway dancer he wanted a comedy and tragedy mask as well. The basic shape of the curtains and footlights were already die cut so I came up with some dramatic drapery to give it depth. For the sides of the theater they wanted to use my Mr. Peanut and Mr. Softee portraits as old theater posters. I gave the portraits yellowed, ragged edges and faded them a bit in Photoshop to age them. Then added in old fashioned hand shaped arrows pointing to the Stage Door and the Ticket Booth. As soon as the carpenter puts it all together I will add some photos of the finished theater. This was truly the best kind of project: not only did I get to be creative and have fun but I also made 2 new friends in the bargain! 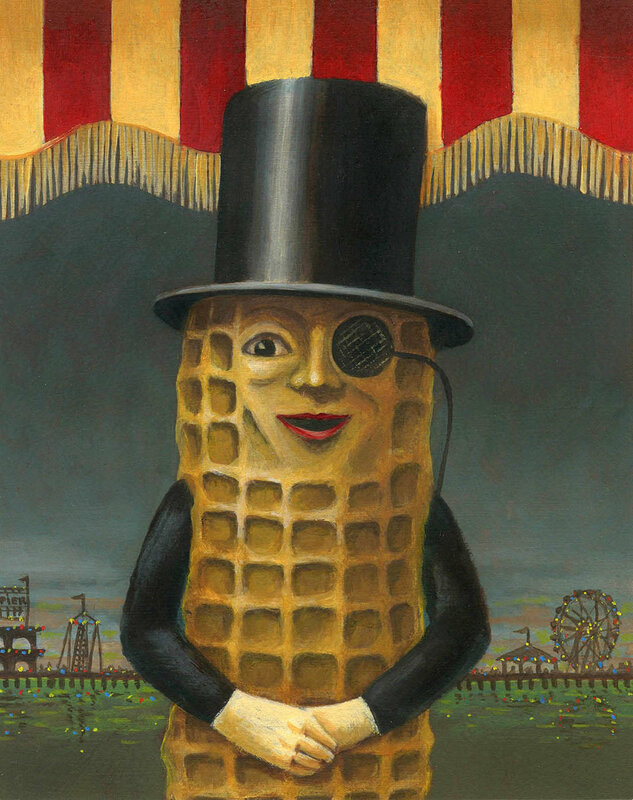 I recently finished a particularly fun commission of 3 paintings: variations on my Mr. Peanut, Mr. Softee and Uncle Omelette portraits. My client loved the dark humor of the originals and wanted something very similar but with a twist. We decided to have Mr. Peanut shown in front of his own shop window on the Atlantic City Boardwalk eating a bag of fresh roasted peanuts. For Uncle Omelette we thought he could be actually cooking eggs as a street food vendor and we have Mr. Softee eating an ice cream cone in a night time setting with strings of lights instead of bunting behind him. These were three of my very favorite portraits and it was such a pleasure to re-visit them with this new set! Prints are available in my shop Curious Portraits. 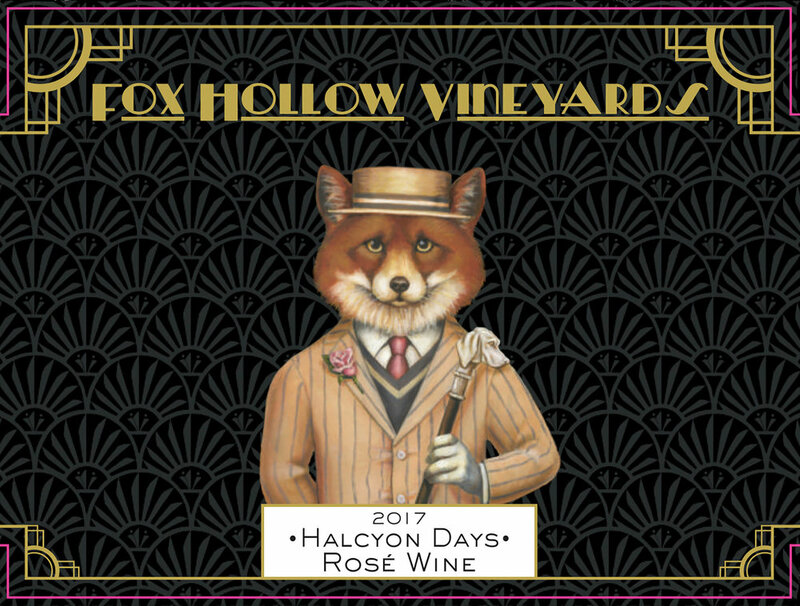 The idea of painting a series of farm animals has been in the back of my mind since I visited Fox Hollow Farm while working on their wine label and met so many beautiful animals. A few weeks ago I was enjoying a particularly creamy and delicious camembert when the idea of combining my love of cheese with the farm portraits came to mind. After some research I settled on 3 of my favorite cheeses made from the milk of a cow, a sheep and a goat. The three finished dairy animals complete with their own special cheeses. 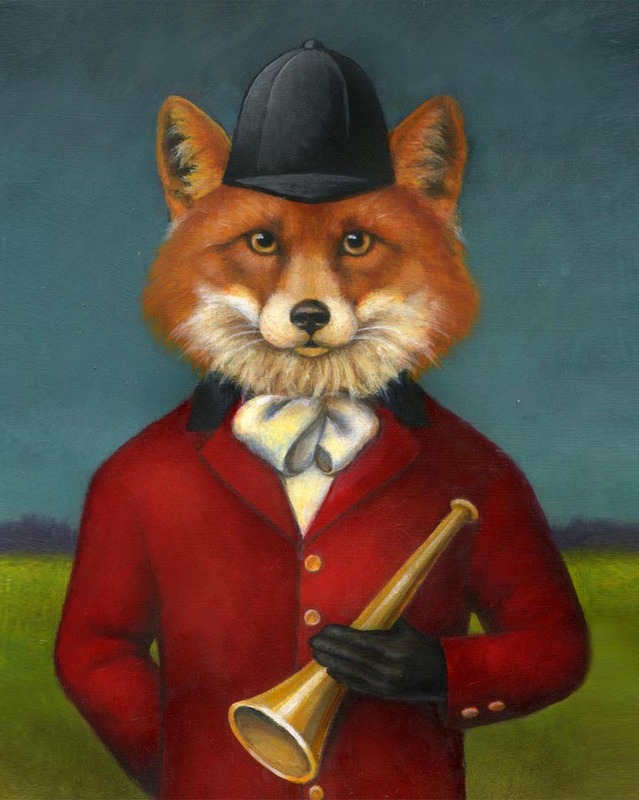 I painted the animals as individual portraits first. I then created the laurel wreath, the banner and the cheeses on the plates separately and put them all together in Photoshop for the final artwork. The three original dairy animal portraits without their laurel wreath frames. I wanted them all to have a different sky. From the beginning I knew that the sheep should be on a night time sky, given the association of counting sheep, and the deep blue ground would set the white of his wool off nicely. The goat had such a cheery face that I thought he should be set against a clear blue sky with fluffy white clouds and the cow reminded me of early morning milk for my coffee and cereal so he is pictured with a colorful dawn sky. The original sketches before I worked out the laurel wreath frames. I toyed with the idea of putting each cheese on a differently patterned plate, mostly because I have a passion for mismatched vintage china, but in the end I thought keeping the plate, wreath and banner consistent in all three tied them all together as a set. The portraits are all available as prints with or without the frames and cheeses in my Etsy shop Curious Portraits. My most recent project for The Writer’s Chronicle was an open ended assignment which was both a challenging and satisfying puzzle to solve. The cover illustration was for an essay about the Pulitzer Prize winning novel A Visit from the Goon Squad by Jennifer Egan which focused on the structure of the book: the way the chapters stand on their own as well as making up a larger story while moving back and forth through time. I began by jotting down ideas as I read: time passing, relationships and looking back, for example. The theme of time stood out to me so I knew I wanted a clock face to feature. Another strong element was the way the individual chapters functioned as cells in a comic strip, or frames in a strip of film. After some experimentation I decided that to convey the feeling of nostalgia the piece evoked in me, I would represent time by creating a clock themed background wallpaper that had a vintage feel and over lay framed images that when seen together, created one larger image. I put this together digitally for the concept sketch using stock clock faces and sketched frames but for the final I hand painted the clock faces and the frames and layered them in Photoshop. The only change we made was to brighten the sepia toned palette of the sketch. I chose a soft color story inspired by vintage wallpaper. I love projects like this that stretch my imagination and give me total freedom to experiment.